Here at Horizon, we believe new nuclear power is critical to delivering the secure, low carbon and affordable energy the UK needs into the future. So we're proposing to build a new generation of nuclear power stations at Wylfa Newydd, on Anglesey, and Oldbury-on-Severn, in South Gloucestershire, with enough capacity to power 11 million homes. Our projects would create up to 850 permanent jobs at each of our sites, with a construction workforce of around 4,000 workers for the majority of the time. 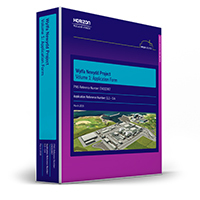 In January 2019, we announced we were suspending work at Wylfa Newydd, as well as at Oldbury, after it hadn't been possible to reach an agreement on the financing and associated commercial arrangements in time to sustain ongoing levels of development. It is hoped a way forward can be found, in discussion with UK Government, that will allow activity to resume so our projects can play a key role in the UK's low carbon energy future.